Containers are used to organize and group single widgets. Besides the common attributes, there is a set of container-specific attributes, which any container can have. The common attributes below are not used for the vpaned and hpaned containers. Top, bottom, left and right padding (pixels). The padding serves to set the distance between the border of the widget and its content. Left and right padding (pixels). Top and bottom padding (pixels). This attribute is used the same way as padding_lr, except that the top and bottom padding is specified in this case. Corresponds to an object of the WidgetVBox class. Whether the container has a background or not. The default is 0 (boolean, no background). Whether the container cuts off its children along its bounds. Everything that lies outside of them, is not rendered. Only works for children with align="overlap" flag set (otherwise, they will expand the box widget and no cutting will be done). The default is0 (boolean). 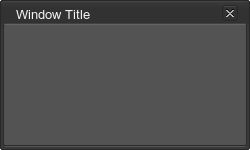 In this example, a space between items is set by using the space_y attribute, and the font of the menu title is set by using the font tag with theface attribute. Corresponds to an object of the WidgetHBox class. Whether the container has a background or not. The default is 0 (boolean). In this example, a space between items is set by using the space_x attribute. The font of the menu title is set by using the font tag with theface attribute. Corresponds to an object of the WidgetVPaned class. This widget should contain exactly two children. Value in range [-32767; 32767]. -32767 means that during resize the upper child will remain fixed. 32767 means that during resize the lower child will remain fixed. 0 means that both children will be resized equally. Other values specify proportions, in which the children are resized. The default is 0. 0 to resize both children of the vpaned container while window resizing. 1 to set fixed size for the first child. 2 to set fixed size for the second child. You can also use the width attribute to set container width. The other common attributes are also available. Common container-specific attributes cannot be used for the vpaned container. Corresponds to an object of the WidgetHPaned class. Value in range [-32767; 32767]. -32767 means that during resize the left child will remain fixed. 32767 means that during resize the right child will remain fixed. 0 means that both children will be resized equally. Other values specify proportions, in which the children are resized. The default is 0. 0 to resize both children of the hpaned container while window resizing. You can use the height attribute to set container height. The other common attributes are also available. Common container-specific attributes cannot be used for the hpaned container. Corresponds to an object of the WidgetGridBox class. Whether the container has a background or not. The default is 1 (boolean). Width-to-height ratio of columns (vector with integer values). Corresponds to an object of the WidgetGroupBox class. Color of container children. A color is set for all of the children except the specific child text. The result is the groupbox that is placed at the bottom of the window and has the colored background. The title of the groupbox is not colored. To set the color, use the color attribute of the text tag. Corresponds to an object of the WidgetTabBox class. Path to the tabbox texture of mini-icons. This texture is a bar of N pixels in width and N×M pixels in height. Sets the ID of a mini-icon to be used for the item starting from zero. Sets the item data. The data can be used as a text identifier of the item (instead of using the number of the item). See the article on Skin Layout for more details. 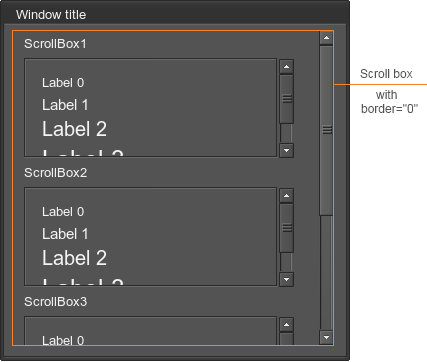 Corresponds to an object of the WidgetScrollBox class. Whether to enable a border line or not (boolean). Whether to enable horizontal scrolling or not (boolean). Whether to enable vertical scrolling or not (boolean). Whether to hide, disable or always render a horizontal scroll bar. 0 to always render a horizontal scroll bar. 1 to automatically hide a horizontal scroll bar, if the container area is big enough to show all elements. If not all elements can be shown at once, the scroll bar is rendered. 2 to always hide a horizontal scroll bar. 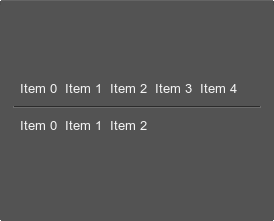 Scroll bar bounds, though a bar itself is not rendered, are still taken into account when the widget bounds are calculated. 3 to always hide a horizontal scroll bar and not to add its size when calculating widget bounds. Whether to hide, disable or always render a vertical scroll bar. 0 to always render a vertical scroll bar. 1 to automatically hide a vertical scroll bar, if the container area is big enough to show all elements. If not all elements can be shown at once, the scroll bar is rendered. 2 to always hide a vertical scroll bar. 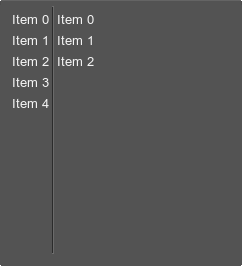 Scroll bar bounds, though a bar itself is not rendered, are still taken into account when the widget bounds are calculated. 3 to always hide a vertical scroll bar and not to add its size when calculating widget bounds. Corresponds to an object of the WidgetWindow class. Whether the window is movable or not. The default is 1 (boolean). Whether the window is resizable or not. The default is 0 (boolean). Whether the window is minimized when double-clicking on it or not. The default is 0 (boolean). Whether the window is shaded when it is not in focus. The default is 0 (boolean). Whether window minimization is animated or not. The default is 0 (boolean). Maximum distance to snap the widget to borders of the application window. The default is 0 (pixels). align with values center, left, right. For example, if you set the maximum window width and height, you cannot make the window higher or wider than this maximum values. The pos_x, pos_y and align attributes are set depending on the required position of the close button. Corresponds to an object of the WidgetDialog class. Whether the dialog is movable or not. The default is 1 (boolean). Whether the dialog is resizable or not. The default is 0 (boolean). Whether the dialog is minimized when double-clicking on it or not. The default is 0 (boolean). Whether the dialog becomes transparent while minimized or not. The default is 0 (boolean). Whether dialog minimization is animated or not. The default is 0 (boolean). Maximum distance to snap to borders. The default is 0 (pixels). On the right picture, the minimized dialog window is represented. The text color is set by using the color attribute.